When the accelerators are asleep, the technical teams get to work. Since 14 December, no particles have circulated in any part of CERN's accelerator chain, from the particle source to the intermediate rings and the Large Hadron Collider (LHC) itself. The annual year-end technical stop provides an opportunity to carry out maintenance work on equipment and repair any damage as well as to upgrade the machines for the upcoming runs. "We started planning this technical stop as early as June 2015," says Marzia Bernardini, the leader of the team that organises and coordinates the work. "Hundreds of people from all the technical departments were involved over the course of the 12 weeks." A long list of maintenance work had to be completed along with important upgrades on all the machines and infrastructures. In the Proton Synchrotron (PS), for example, the third link in the chain, two new items of beam instrumentation equipment have been installed. One ring further along, 16 of the 1818 magnets in the Super Proton Synchrotron (SPS) and its transfer lines to the LHC have been replaced. Since each magnet weighs 16 tonnes, it's a big job, but one that is performed routinely. The SPS will be 40 this year, and its magnets wear out over time and need to be renovated. In the LHC, several major operations are under way. Two beam absorbers for injection have been replaced. These huge six-metre-long pieces of equipment are used when the beams are ejected from the SPS and into the LHC: they absorb the SPS beam if a problem occurs, providing vital protection for the LHC. The accelerator's complex cryogenics system also needs regular maintenance. 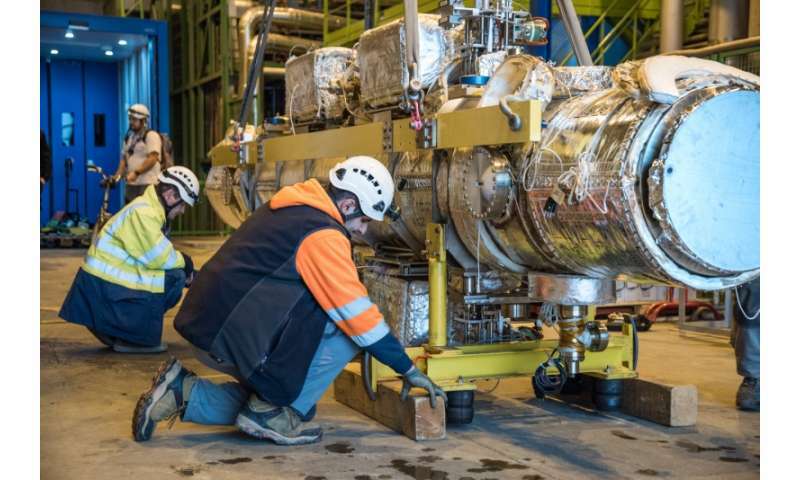 Two of the LHC's eight sectors have been emptied of helium, the cooling fluid, to ensure that no losses occur while one of the coldboxes is being repaired. Twelve collimators, on either sides of ATLAS and CMS, have been dismantled ready to be upgraded. These devices protect the machine by absorbing particles that stray from the beam trajectory. Finally, cabling campaigns are continuing throughout the machine: four teams are working in parallel to install 25 km of signal cabling for new equipment and upgrades.